Productive 3 Dimensional water flow cleans better and minimize clothes entanglement. Integrate with strong current pushing effect, water flow from external cabinet continuously pushes through the inner drum, creating a fast and forceful current that drives the clothing rolling up & down efficiently. The structure of the 3D water flow creates flow current that allows water and detergent to penetrate through fabrics efficiently. Enable better and more reliable washing performance with its key features and various washing modes that suits different types of fabric with maximum care to the laundry. The magic clean lint filter in the machine not only helps to prevent soap and lint build-up in the laundry tub but also keeps the lint off the clothes. The washing machine collects lint in the bag-type lint filter from which the lint can be removed manually. The child lock feature enhances safety in every family to protect young children during operation. In addition, it avoids disruption during the washing process. By pressing [PRESET] button for 3 secs. Likewise, to de-activate, press [PRESET] button for 3 secs again. 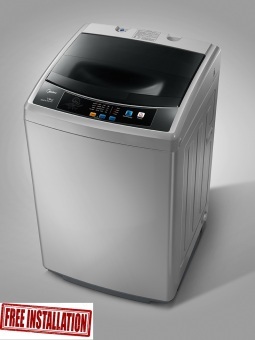 Automatically detects laundry’s load while determine the optimal amount of water to be loaded accordingly. Contact us at 64674833 for more information if required.